Dr. Oliver Wendell Holmes, Sr.
Nostradamus was forced to leave his university studies at Avignon, a French commune in southeastern France, when the Black Death came to town. He wandered the country eight years, researching herbal medicines, and while he eventually continued studies at the University of Monpellier, where he was expelled for having been an apothecary (an undignified profession), and for acts of slander against university doctors. He battled the pubonic epidemic for 20 years following; his dedicated method involved the removal of corpses from the villages he visited, and the prescription of a ‘rose pill’ to ward off the disease. His rose pill contained a strong dose of vitamin c, and was relatively effective as a preventative measure (other popular treatments included bleeding and prayer). After the dissipation of the plague, Nostradamus was recognized as a hero to the towns he visited, and the city of Aix bestowed upon him a pension for life. 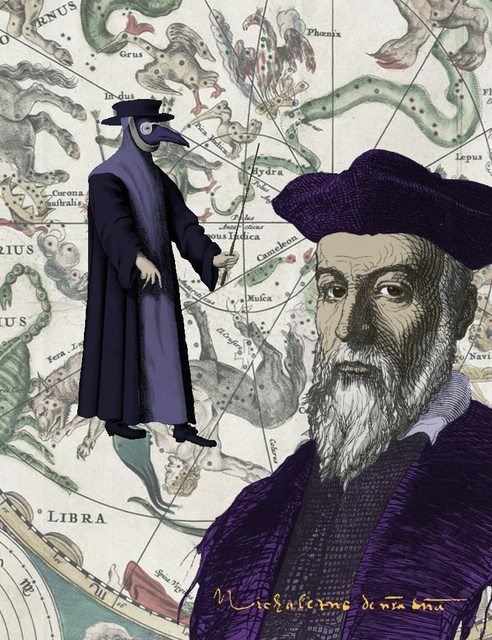 In 1547 Nostradamus settled in Salon, married, and shifted his interests toward the stars. In publishing a series of almanacs he in which he made over six thousand prophecies, he drew upon the practice of Judicial Astrology, and through these methods authored the pinnacle of his achievements, Les Propheties, a book of one thousand divinatory quatrains. In his later life, Nostradamus feared death from the Inquisition (due to the unchristian nature of his prophetical methods), but he maintained a good relationship with the church. He was so popular with Europe’s elite that by the end of his life, he was appointed as Counselor and Physician-In-Ordinary to boy-king Charles IX of France.